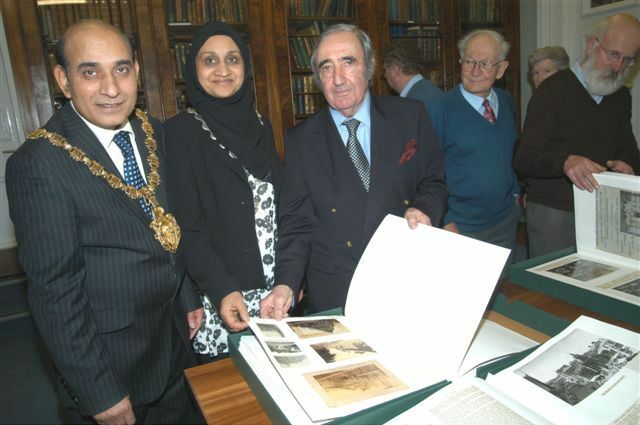 The Stacey albums, donated to Saffron Walden Town Library by former Town Clerk and local historian H.C. Stacey, incorporate several thousand photographs, cuttings and ephemeral printed items, and provide a unique record of the people and buildings of Saffron Walden. Compilation of the first of the Stacey albums was a team effort. The photographs in it were arranged by local historian and former teacher C B Rowntree and H.C. Stacey (‘Cliff’). Photographs for the first album were taken by M. L. Haselgrove, T. W. Cloughton, David Campbell, G. H. Oakes, and W. De Barr and others. The albums were huge and specially made. When passed to the Library shortly before his death by Cliff Stacey, there were five of these massive volumes and they were already showing signs of the heavy use made of them over the years. The Secretary of the Town Library Society, Martyn Everett arranged for their conservation by the Town Library’s conservation bookbinder, Clive Bovill. A large amount of the cost was donated by the family of Mrs Lucy Nottingham, and there was also help from the Gibson Walden Fund. The restoration of the albums took six years to complete. Town Library Society volunteer, Mrs Jo Jeffrey, re-typed all the captions. Each volume was also microfilmed at the Essex Record Office. Clive made a complete set of new albums from acid-free paper, each one covered with green conservation grade cloth, and provided with a matching box, and during the following years supervised the transfer of the material by his assistant Sue Andrews - a painstaking process. The conservation work was completed in the autumn of 2007, and the albums were displayed at a members’ reception held in the Library in December. A rich and remarkable record of the town successfully restored. 1) The sub-heading “General” is used to indicate that no detail was specified in the original index. 2) For the convenience of readers, some cross-references not in the original index have been inserted. missing information or correct any errors should in the first instance consult the Town Librarian.